Steve G. Jones, Ed.D., Clinical Hypnotherapist, charges $1,500 for a custom recording and $25,000 for a one-hour private hypnotherapy session at his office. But you can get all the benefits for this low price. Simply listen to the Stop Chewing Tobacco Hypnosis MP3 every night as you go to bed for three weeks and feel the changes happening in your life. You will feel more empowered, more in touch with your true self, and you will truly know that your goals are within your reach. Steve G. Jones achieves AMAZING and LASTING results!!! Hypnosis is the easiest way to affect change in your life because the positive messages go straight to your subconscious mind effortlessly so you can accomplish your goals and reach for the stars!! All you have to do is listen to the Stop Chewing Tobacco Hypnosis MP3 audio at night as you go to sleep!!! You’ll hear soft music, the gentle sounds of the beach, and the soothing sound of Steve G. Jones’ voice all working together to bring about positive changes in your life easily and naturally. Steve G. Jones has been helping people improve their lives with hypnosis for over 17 years…now it’s time for him to help YOU… don’t wait, do it NOW !!! you’ll be glad you did. See you at the top! Willingness is a state of mind and you are willing to stop chewing tobacco because that is what you want. You will succeed. You are willing to do whatever it takes to produce the results you want. You choose to get rid of tobacco purchases. Just be willing, be willing. Be willing to do whatever it takes to quit. Your thoughts create your behavior. When you have a behavior you want to change, you change the thought pattern and the behavior changes automatically. All of your behavior results directly from your thoughts. Therefore, think of yourself as a non tobacco user. Hear yourself saying I no longer chew tobacco. When someone offers you tobacco, hear yourself saying, no thanks, I don’t do that anymore. For your body, tobacco is poison. You want to live a long and healthy life. You owe your body respect and protection. You have made a commitment to protect and respect your body and when you do that, you then have the power within you to chew your last cigarette. You will quit chewing tobacco easily and effortlessly. Just relax, let it happen, hear yourself repeating slowly in your subconscious mind, I no longer chew tobacco, now and forever more. I am going to make this work. I expect this to work. I now allow myself to rid my life of tobacco purchases. I deserve to stop. You will maintain your it permanently. You will be relaxed when others are chewing around you. Tobacco is poison. Tobacco is filled with bad substances and then when someone offers you tobacco, hear yourself say no thank you, I quit. You are now and forever more against chewing tobacco. In the morning, before you can even open your eyes tell yourself, I am strongly motivated to quit chewing tobacco, one day at a time easily and effortlessly. See yourself going through your day and night without tobacco. That’s right, see yourself getting up in the morning without tobacco. See yourself having coffee or reading the paper, doing what you do in the morning without tobacco. See yourself on the phone, without chewing tobacco. See yourself driving, playing your favorite music, relaxed and comfortable, without chewing tobacco. See yourself after a meal, without tobacco. Relaxed and comfortable, no interest, no desire. See yourself doing the things that you do throughout the day, whatever they may be, without chewing tobacco, uninterested, no desire. See yourself out with others, and someone else is chewing tobacco, tell yourself, chewing together is not a sign of friendship. Tobacco is poison. You now and forever more stopped using tobacco purchases. And long ago there is a food that you decided not to eat. Imagine that food now. You made a decision that you would not eat that food and nothing and no one could make you pick up a fork and eat that disgusting and nauseating food. Just as now you have made your choice to quit chewing tobacco and nothing and no one can make you take that away from you. Every time you take a look at tobacco you will think of that food and nothing and no one can make you start chewing again. You have now and forever more rid your life of tobacco. And as you relax I would like you to recall a time in your life, a time in your life when you felt completely confident and proud of yourself. See that moment clearly. Notice the colors in the room. Hear the sounds associated with that event. Notice any odors associated with that event. Feel the atmosphere, your clothes, and the temperature and now make all of those sounds, sights, and smells even more vivid and now allow the feeling of pride associated with this event to build in intensity. And when you feel the pride associated with this event at the maximum level of intensity, make a fist with your hand and as you hold the fist tightly, take three slow deep breaths, in and out. Feel even more intensely the pride that you felt during the event. That’s right, you are there now at that event. Feel that adrenaline rush and as you breathe in and out now. Feel the sense of pride begin to get stronger. Now unclench your fist and relax even more deeply. You have given up on chewing tobacco. I am going to give you a post hypnotic suggestion. A post hypnotic suggestion works long after the hypnosis session is over. For your benefit you will use the suggestion as long as you need it. When you no longer need it, it will just fade away. If you ever feel an urge or a craving for tobacco, you will make a fist with your hand, that’s right, a tight fist. This is now your power hand. This is a signal to your subconscious mind which says I am powerful. I am a non smoker. Now take three deep breaths in and out. And as you exhale each time, exhale all of that craving out into the atmosphere where it just dissipates and fades away. Remember if you feel a craving, make a fist and take three deep breaths. Tell yourself that a craving for tobacco lasts for just a few seconds and after you have done this, you can relax that hand. All you need to cope with is a few seconds, so distract yourself. Think of the food you want to eat, this is not deprivation, this is reward. Tell yourself, I am not giving up pleasure, I am giving up poison. If I never take the first puff, I have no problem. You no longer chew tobacco. Imagine yourself one year from now. You are out with friends. You feel great. You look great. It has been a wonderful year. Perhaps people around you are chewing tobacco. As you watch them chew away, you think about how lucky you are to be rid of that dirty, killing habit. Hear someone offer you some tobacco. Hear yourself say no thank you, I stopped chewing tobacco. You have kicked your habit of smoking tobacco and every night before going to sleep, tell yourself, I no longer want or need to chew tobacco. I will allow myself to quit chewing tobacco. I deserve to treat myself better. Relax, let the results take care of themselves. You have done it, you no longer chew tobacco. You have given up tobacco for many reasons. Think of those reasons now. Clean, clear, healthy, pink gums. More energy, more stamina. Clean smelling mouth. Clean smelling breath. To be a better influence. To reinforce your confidence, to live a longer and healthy life and all the other good, positive, powerful reasons you have. You no longer chew tobacco. No matter what is going on in your life you no longer turn to tobacco. No matter how aggravated you may be, nothing and no one can make you chew tobacco again. No matter how upset and sad you can be at times, nothing and no one can make you chew tobacco again. No matter how heart broken or aggravated you may be from time to time, nothing and no one can make you go back to using tobacco. Believe it. Trust yourself. Trust your subconscious mind. A habit that is not fed is soon gone. You kicked your habit. Now all thoughts, all cravings, all urges connected to tobacco are gone from your mind and your body. Let it happen. Let it happen easily and effortlessly. You have given up tobacco for yourself. Congratulations. Since you are looking at hypnotherapy as a tool to stop using chewing tobacco, we are guess you already know the consequences tobacco can have on your body. Chewing tobacco has been shown to cause cancer, especially cancer of the mouth and pancreas. We applaud you in seeking help to overcome your habit of chewing tobacco. Realize that hypnotherapy can train your subconscious mind to let go of your bad habit. 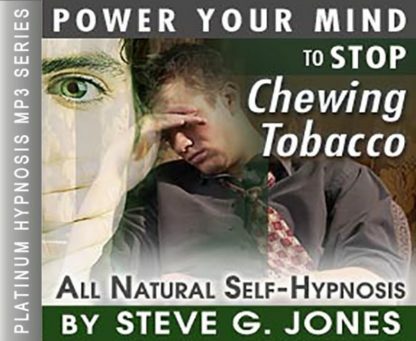 You can stop chewing tobacco with the help of self-hypnosis. The Stop Chewing Tobacco Hypnosis MP3 session will put you in control over your habit, no longer allowing your habit to control you! We suggest you pick a quit date some time in the future, about 2 or 3 weeks and then start listening to the hypnosis recording for 21 nights in a row. We suggest you listen to the recording at night because at the end, Steve will suggest that you fall into a deep sleep. In three short weeks, you can overcome your habit of chewing tobacco!